Women’s sexuality has been included in the development agenda mainly in relation to health and risks. More recently the approach towards sexuality has incorporated women’s rights to pleasure and to control their reproductive capacities. In Nicaragua, feminist organizations have been working with young women in these topics, intersecting their agendas with the development agenda in some aspects, and differing in others. 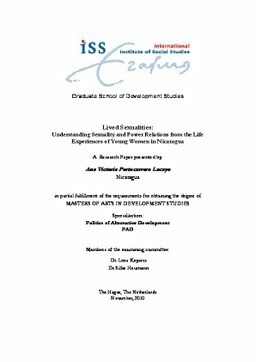 This paper looks at the way in which young Nicaraguan women experience and give meaning to their sexuality in their daily lives and in their interactions with two feminist organizations that work on the topics of sexuality and gender power relations. These organizations have critically incorporated the approaches of “empowerment” and “rights”, in vogue in the development discourse, in their work with young women. These approaches have been challenged by feminist and sexuality scholars. From the perspective of young women that have been engaged with feminist organizations, this paper reflects on the theoretical and practical challenges that the frameworks of “empowerment” and “rights” poses to the understanding of women's sexuality and power. -- Relevance to Development Studies -- A paradigm of Development that is people-centred and aims to enhance people’s quality of life cannot exclude the sphere of sexuality. Sexuality has served as an instrument of power to distribute material and symbolic resources based in the alleged “normalcy” and “superiority” of certain bodies and practices. Hence sexuality can also be an instrument of reversion of inequalities, which involves the politicization of the approaches towards sexuality in the development field. It is necessary to analyse how these processes of social change occur at the local levels, and from the experiences of young women, in order to gain better understandings of the complexities it entails.